Ronny Gal, Ph.D., a senior analyst at the investment research firm Sanford C. Bernstein & Co., recently published a fascinating report on the size of pharmaceutical manufacturers’ charitable foundations. Ronny has graciously agreed to let me share the high-level results below. 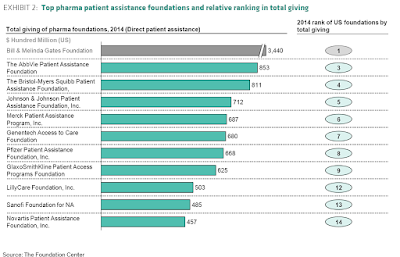 Ronny and his team found that pharmaceutical manufacturers’ patient assistance programs (PAPs) account for 10 of the largest 15 U.S. charities and provided $6.5 billion of support in 2014. (See table below.) On average, the manufacturers’ financial support accounts for 8% of their operating expenses. PAPs are controversial and closely monitored. As I argue below, their growth is linked to pharmacy benefit designs that shift prescription costs to patients. Many insured patients face economically-debilitating coinsurance—in some cases with no limit on out-of-pocket expenses. The programs are an imperfect, but necessary, fix to our imperfect drug channel system. Ronny has provided some valuable facts that show how important these programs have become. Patient assistance programs (PAP) focus on patients who meet financial eligibility criteria—those without insurance and those denied coverage by their commercial plans . PAPs differ from copayment offset programs that cover a commercially-insured beneficiary’s out-of-pocket costs. Copayment offset programs may not be used by beneficiaries of any federal healthcare program, including Medicare Part D. PAPs, however, can support patients with government-sponsored insurance. These PAPs are often incorporated as nonprofit charitable foundations. The Office of Inspector General (OIG) has issued extensive guidance and advisory opinions on such charities. Consequently, a foundation is required to certify that it has means tested the patients it serves, among other requirements. Consider, for example, this May 2014 special advisory bulletin (SAB), which addresses independent charity PAPs. Due to the cost-shifting that we describe below, pharmaceutical manufacturers’ PAPs account for 10 of the largest 15 U.S. charities. The data come from 2014, the most recent year available. Collective spending by these 10 foundations was $6.5 billion. It’s surely even higher now. 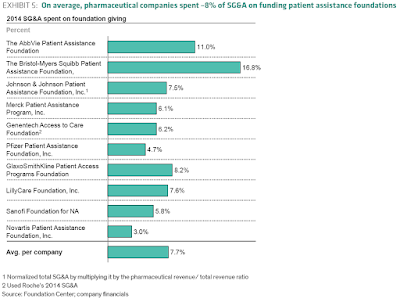 According to Bernstein, manufacturers account for patient assistance programs as part of sales, general, and administrative (SG&A) expenses. By contrast, rebates are reflected as part of gross-to-net computations. 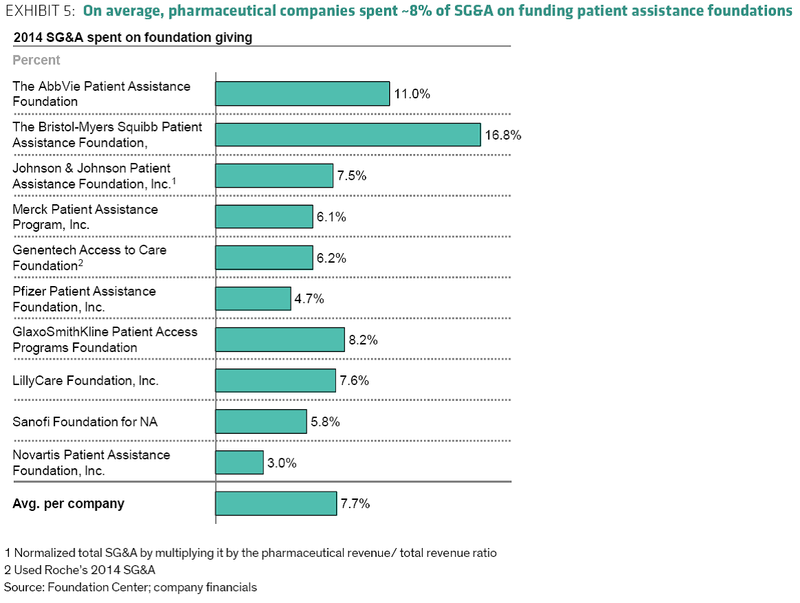 As the chart below shows, their analysis found that on average, patient assistance accounted for about 8% of SG&A in 2014. 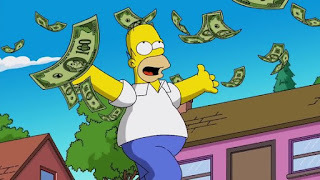 As I see it, PAPs have become so large in response to benefit designs that shift drug costs to the sickest patients taking the most innovative specialty therapies. In 2016, nearly all Medicare Part D plan offerings had five tiers: preferred and non-preferred tiers for brand and generic drugs, plus a tier for high-cost specialty drugs. These benefit designs essentially discriminate against the very few patients undergoing intensive therapies for such chronic, complex illnesses as cancer, rheumatoid arthritis, multiple sclerosis, and HIV. PAPs are crucial for patients with coverage under the Medicare Part D program. These patients face unlimited out-of-pocket spending after reaching the catastrophic coverage limit, which is $8,071 in 2017. The new Medicines Use and Spending in the U.S.: A Review of 2016 and Outlook to 2021 documents this scale of this cost shifting. 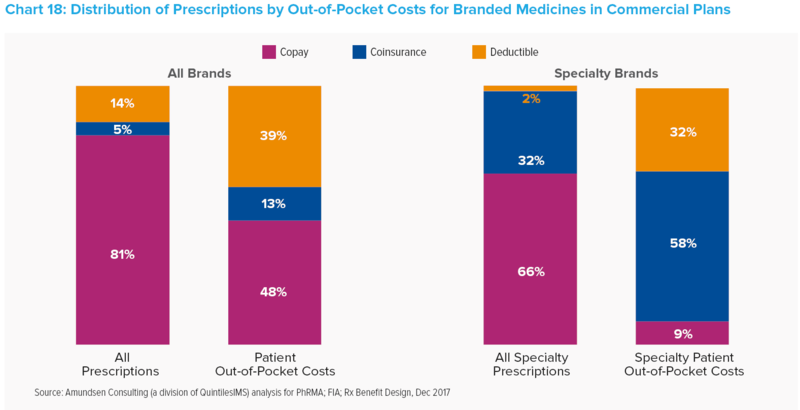 As the QuintilesIMS chart below shows (on the left side), patients with a prescription in the deductible or with coinsurance accounted for 19% of prescriptions but more than half of total out-of-pocket costs in 2016. Deductibles and high coinsurance rates for specialty drugs force manufacturers to cover patients’ large out-of-pocket costs. Thus, manufacturers’ PAP and other programs can be seen as a roundabout way for third-party payers and PBMs to extract additional discounts from pharmaceutical manufacturers. Given the evolution of benefit design, manufacturers' PAPs show that charity begins at home.